Exclusive coffee table with tiles in elegant herringbone pattern and coloured metal frame for a modern look. The design is inspired by the traditional tile-topped table and has been brought into the present with a focus on quality and craftsmanship. The Herringbone Tile coffee table adds a sophisticated edge and modern charm to your sofa arrangement and makes your living room design more personal. Style and functionality go hand in hand as hot drinks, teapots and other hot objects can be placed directly on the coffee table. The beautiful tiles are laid by hand in Denmark and together with the metal frame, they create a level surface on the tile-topped table that brings the elegance of the classic herringbone pattern into the modern home. 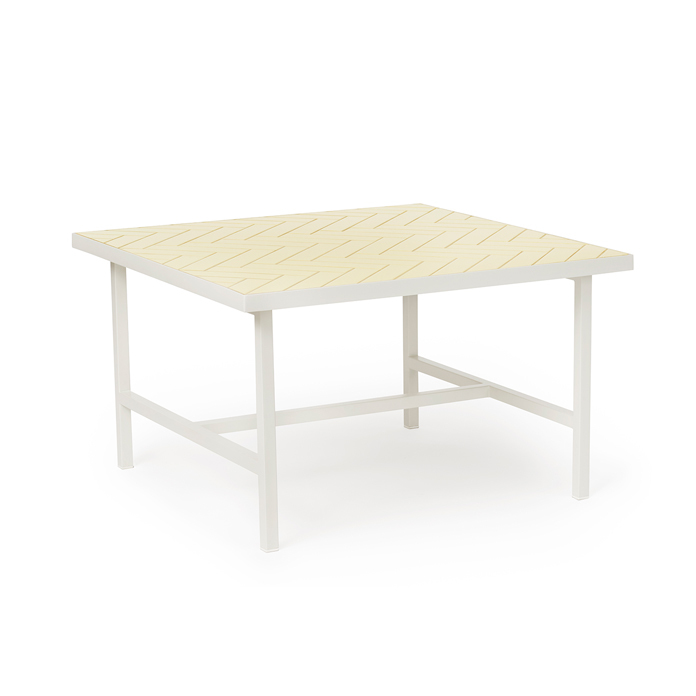 The high-quality joints ensure that they do not absorb dirt and liquid so the table always looks beautiful. Choose between frames and tiles in several stunning colours from the Warm Nordic universe to match any request for either a simple or more colourful look. 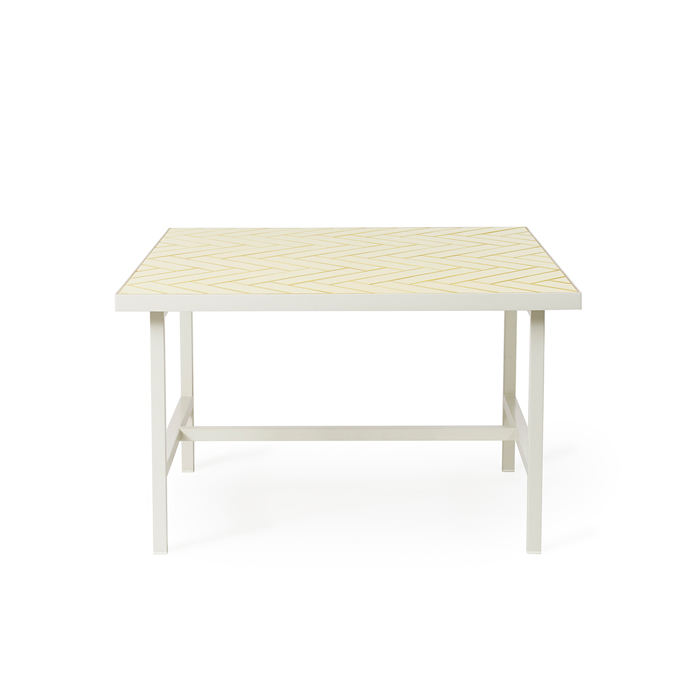 The coffee table is part of the exclusive Herringbone Tile range. 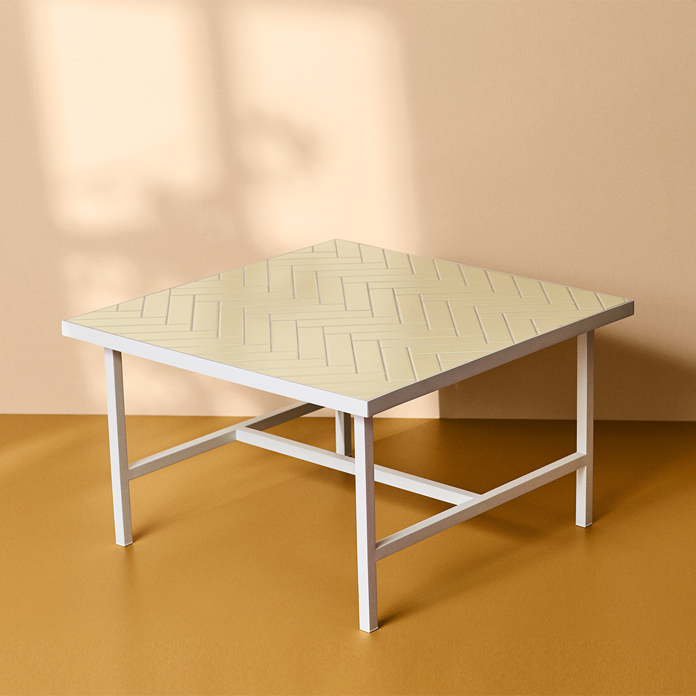 The range offers a modern interpretation of the popular tile-topped table from the 1960s, which has been given new life with a metal frame and a simple and elegant pattern, referencing exclusive herringbone floors. Both the tile-topped table and the herringbone pattern go back hundreds of years; indeed, the Herringbone Tile coffee table beautifully embraces historical references and classic craftsmanship in a contemporary design. This range by Charlotte Høncke also includes a dining table, a small side table and a console table. It is the details that make Charlotte Høncke’s design stand out. One of this Danish designer’s great passions is upholstered furniture, in which original stitching, colour scheme or a surprising shape arouses our curiosity. In Charlotte Høncke’s designs, richness of detail co-exists with pure shapes and lines, while taking functionality into careful consideration. Charlotte Høncke immerses herself in the process of creating exquisite designs for the home, capturing a sense of entity, cosiness and a timeless aesthetic, which not only harks back to history, but also embraces the spirit of our age.